Recompiles can be a hidden bottleneck on your server, and it may not be too obvious. I should know, it happened to me. Unfortunately for me, that was before I was a proponent of tracing or using XEvents to watch for recompiles. Fortunately for you, the experience changed me, and I enjoy sharing my experiences. The proc was pretty simple, taking on average about 0.150 seconds to run. Sounds great until you remember that it’s being called about a hundred times for a page load on a web application. 100 * 0.15 = 15 seconds for the page to load, not counting anything else running. Users were threatening to not be users anymore even though they were happy with most other aspects. I got into it, reworded the query a little, created a perfect index for it, and it got it down to 0.100 seconds to run. This was a large concession on my part because I HATE perfect indexes for a single query, and feel strongly that indexes should focus more on being reusable by many queries. However, even that only got the web page to load in 10 seconds. Traces of the proc confused me. The statements were running in 0.010 seconds, and there was a 0.090 second gap between runs. That gap was 9 of my 10 seconds. At 10 seconds users avoid a website, but at 1 second users have to be prompted to say it’s not as fast as they’d like. It took me longer than I’d like to admit to figure out that every run was kicking off a recompile that took 0.090 seconds. This is the point where I started tracing for the recompile reason, and found out it was because statistics were being updated. However, there were no stats in my database that were updated in the last 15 minutes, so I would have never guessed this was the reason without tracing on this event. Then I came up with a very odd solution that I’ve never seen or heard of before that point, and I haven’t used much since that point. The temp table was swapped out for a table variable. No stats to be updated, so no recompile. Although it assumed there would only be one record in the table variable (it always does), the execution plan was the same. The only difference was the total 0.100 second duration was dropped to 0.010 after losing the 0.090 recompile. User experience was now a web page that loaded up in just over 1 second, with most of it still being this query. There wasn’t anything more I could do except wait until the page could be rewritten by development where I could rewrite it to get all the results at once. That process took time, and customers were not impatiently watching to see when it would happen. I wrote this talking about the users, and users care about duration. However, that’s not the whole story. The 0.090 recompile was pure CPU time, it happening 100 times per page call added up to 9 seconds of pure CPU time, and the users having to use this page hundreds of times a day added up to a noticeable impact on the server performance when it went away. Now I admit that the users only used this when they HAD to instead of when they should have, so it was balanced out a little by the users opening the page about twice as often. Even then, it was still obvious that it was gone when comparing long-term CPU usage. Side note for all of you managers out there… My manager pulled me aside the next week saying “step into my office for a second.”. I admit, that statement always makes you nervous, even when you KNOW everything is going great. He proceeded to tell me that before I started with the company they pulled developers and a DBA into a task force that spent tons of money to improve performance, upgrading servers, upgrading the SAN, upping the WAN speed, and looking into the database. Then he said that I did more in one day than they did in 6 months without spending any money, and that I should take my wife out for a nice dinner and bring him the receipt. Now I know that the hardware upgrades helped out, that I only helped a single process that day, and many other things that could belittle what happened. I also know that spending $100 was very minor in terms of the effect that change made for the company. That’s not how I saw things. What I saw was a response that stuck with me, a lot. Management stepped back to recognize a difference someone made, and made sure they knew they were appreciated. Then took it a step further bringing the family into it, having my wife feeling proud and appreciated at the same time. I know the constraints management is under and all the things they can’t do. That being said, the only thing that frustrates me about this situation is that I don’t see others in management taking the same approach. I swore from that point that if I ever became a manager my one odd request would be that I would want a very small budget in writing to use at my digression. Small things to show appreciation go a long way. The challenging part for me, and where I felt I didn’t do as well as I should have done, is that this flew under my radar. 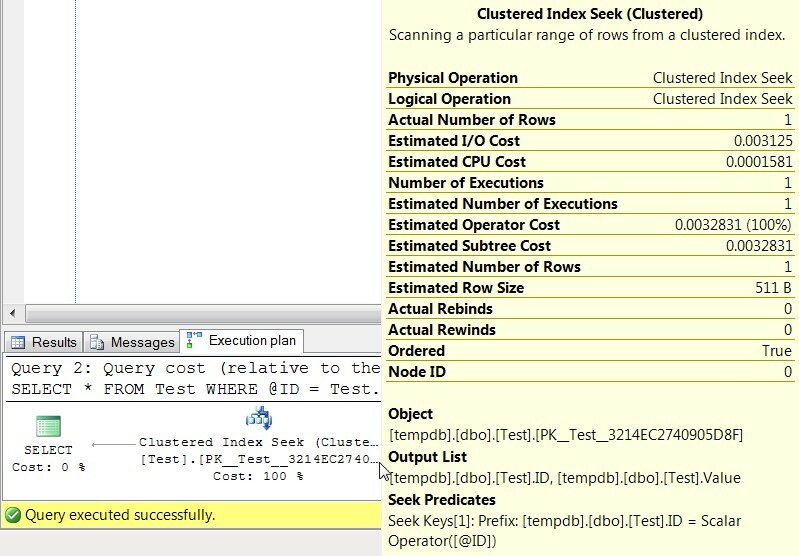 I was tracing for anything that took over 1 second duration and was looking at the most expensive queries all the time. However, this one took 0.150 seconds and never accumulated time in the plan cache due to the recompiles. Here’s the thing, I pride myself on being specialized in database performance, so I feel I should have seen this before having someone in customer service casually mention it to me in conversation. It wasn’t even a request to look into it, just mentioning he just got off a call with the customer about the page, and that the page never worked right with no one being able to fix it. After finding and resolving the root cause of the proc, I also wanted to find and resolve how this flew under my radar. This came up to two primary responses. First, the page was taking too long as a whole, so I requested stats on a per-page basis – how long it took to load each time and how long cumulatively. Second, I started watching for recompiles from time to time. Either one of these would have led me to this issue well before that point. This post is not about monitoring performance on a website, so, although it’s a very important thing to do, I won’t be mentioning that part again. This post is about recompiles, how they can drag you down, and how you can find out about them. I covered how they drug me down, and in past posts I casually mentioned you should use server-side traces or XEvents to monitor them. Then I left it up to you to figure out how. Lets try a different approach today. Recompiles aren’t something I’m watching for constantly, so I’m not going to run any kind of monitoring constantly for them. What I’ll do is run an XEvent session for 24 hours and analyze what it picked up. If it didn’t recompile often that day it almost definitely does not belong on my priority list, so this works for me. Here’s my session. It starts immediately, writes to five 10MB rollover files, and will not start the next time your services restart. Then I’ll use this query to look at my session. It’s a little awkward in two ways. First, I only leave the session running for a day, but this script needs it to be running to read from it. The only reason for that is it pulls the file path from the running sessions. You can get around this by putting the path into the script manually. As for me, I usually query it and figure out my next steps while it’s running, then I stop the session. When you get the results in the #Queries temp table in the end they’re what you’re used to with it just being a table and all the XML out of the way. The query at the end of the script views them all, but I’ll play around with it doing aggregations and more. I encourage you to do the same. This is also why it drops the table if it exists in the beginning instead of dropping them at the end. Let me know how this helps. If anything can be done to make my approach or my scripts better, I’m always open to improvement. 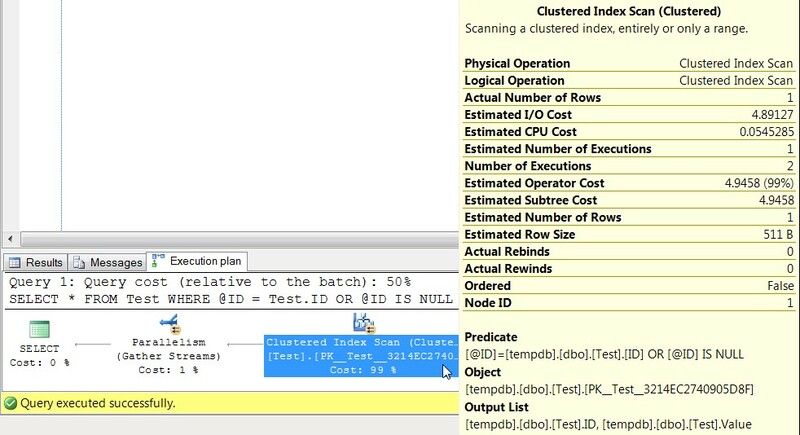 Optional parameters in a stored procedure often lead to scans in the execution plan, reading through the entire table, even if it’s obvious that the right index is in place. This is extremely common in procs that are used behind search screens where, for example, you could search for a person according to their first name, last name, city, state, zip code, gender, etc. To take a simplified look at this, make a quick and easy table consisting of an indexed identity column for us to search by and fluff to make the row size bigger. Now we’ll create a proc to get data. In this proc we’ll get the data several different ways, showing the advantages and disadvantages of each method. You’ll notice that I put my comments as PRINT statements, which will make it easier for you to read through the messages tab and see what’s going on. Now that we have the data and proc, just execute it. It will be best if you add the actual execution plans to this, which you can get to on your menu going to Query / Include Actual Execution Plan. If you don’t know how to read execution plans then this is even better! No experience necessary with plans this simple, and you’ll start to feel more comfortable around them. Even with the default values for the parameters the query optimizer knows that you could have easily passed in NULL for the values, and it has to plan for everything. Lets step through the results to see what this all means. Part of that planning for everything is saying that @ID IS NULL will be used instead of ID = @ID, so the query optimizer can’t say for sure that it can just perform a seek on that column. In the messages tab we have the number of reads done by each statement courtesy of me adding SET STATISTICS IO ON in the proc itself (bad idea in prod, by the way). For the first one we have 7272 logical reads, saying we read 7272 pages of 8kb of data, so we had ask the CPU to play around with over 56 MB of data to find records that matched. Looking at the execution plan we can see why that happened. The Predicate you can think about as the “Scan Predicate”, since it’s saying what you couldn’t seek for and had to scan instead. In this case it’s showing the entire “@ID = Test.ID OR @ID IS NULL” in there, because it compiled a reusable plan that might be used with a NULL. In the next statement we were able to do a seek, doing only 3 reads. This is because there are two levels of the B+tree on this index, so it read the root level, then the next level of the B+tree, and finally the single leaf level of the index that contained the data we wanted. Take a look at the execution plan here to see the difference with not only the Seek itself, but the Seek Predicate in the details. You’ll see that it uses @ID in there still showing that it’s a reusable plan ready for any ID to be passed in, but the WHERE clause is telling the query optimizer that it can always use a seek to find this data. Now that I know you can read through a couple yourself, I’ll skip ahead to the 6th query where we used the same “@ID = Test.ID OR @ID IS NULL” that caused is trouble before, but did OPTION (RECOMPILE) at the end of the statement. Again it did the same 3 reads I just mentioned still using a seek, but the details of the execution plan looks different. The seek predicate used to say @ID so it could be reused, but the query optimizer knows nothing with OPTION (RECOMPILE) will get reused. Knowing that, it simply converted @ID into a constant value of 125 and was able to eliminate the possibility of 125 being NULL. If you want to get more into the details, you can look at the XML version of the execution plan by right-clicking on the plan and selecting “Show Execution Plan XML…”. 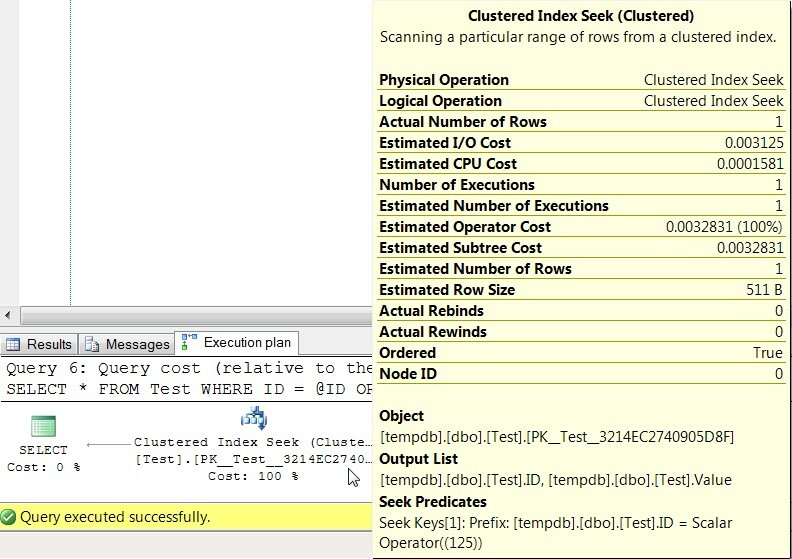 Here’s what you’ll find for the parameter’s value in the first two queries. It shows that the value that was sniffed when it was compiled was 125, and also that it was run this time with a value of 125. If you ran this again passing 130 in then you’d see the sniffed value staying at 125 because it’s not going to use CPU resources to recompile it, but the runtime value will be 130 for that run. The OPTION(RECOMPILE) versions don’t look like this though, they’re changed to a constant value even at this level. I hope I left you with a better understanding of what happens when you write code for parameters that could be null. We’ve all done this, and many of us (me especially) have been frustrated with the performance. This is a change I put into production not too long ago that ended scans on a rather large table, and the results were noticed in query execution time, the page life expectancy counter since the entire table was no longer being read into memory, and I/O activity levels since that index and the indexes it kicked out of memory didn’t have to be read off of disk nearly as often. Let me know what you think, and especially if you have a better way of handling this issue.